Last week, Skechers (SKX) presented at UBS Global Consumer and Retail Conference, giving interesting updates on the status of their business and their expectations for the future. I think its worth refreshing our view of the stock and its attractiveness. Skechers has lived moments of fast growth followed by periods of decelerations, and the most recent contraction in the stock price, which occurred between 2015 and 2016, created a great opportunity to go long. I picked Skechers as a top long idea for Consumer Alpha subscribers when it was trading at $26.80. After nine months and a 50% return, I still think its worth holding this stock. Skechers growth rates in the past have been particularly volatile. As we can see in the chart below, we have seen large oscillations, with peaks of 40% and bottoms of -20%. Oscillations were even larger if we look at quarterly variations, and margins have been quite volatile as well. Adjusted EBIT margin on a LTM basis oscillated between a negative 6.8% and a positive 12.8%. Anyway, the key drivers of the historical volatility in revenue and margins changed a lot over time and it was clear that the market was concerned about the volatility in revenue and margins and was punishing the company for the apparent lack of control over costs. Nonetheless, a qualitative analysis of the key drivers of margin contraction and the differences with the previous cycles allowed us to take advantage of a depressed stock price to accumulate shares. The market started to believe that problems like the ones that occurred in 2011 would reappear, and it started to discount a similar scenario. Nonetheless, there were some important differences between the recent situation and that of 2011. Before 2011, the company enjoyed three years of fast growth driven by the popularity of its shape-ups shoes – the runaway leaders in “toning,” a new category of sneaker that promised to help wearers slim down and strengthen their glutes. Sales of this category of sneakers grew more than twentyfold in only three years, and Skechers owned about 60% of the market, while about a third of its revenue was generated in this product category. Skechers’ recent growth was not driven by the increasing popularity of one product line in particular, but rather was the result of a constant effort towards international expansion, supported by a wide range of product lines and a much more mature and diversified brand. I also think that we have, similar to some of our competitors but also uniquely, laid the foundation for our growth internationally. It has been a significant growth opportunity for us. It has been a focus of investment but also represents a meaningful incremental opportunity in the years ahead. In many ways, we’re just scratching the surface of what the international markets offer SKECHERS on a long-term basis. There is no doubt that areas like Asia Pacific, Latin America and sub-Saharan Africa show more interesting demographic and economic trends for consumer goods companies like Skechers. Its more difficult to quantify the companys growth prospects in those regions, and this gets even worse if we consider the lower predictability brought by the joint venture model. Nonetheless, the market doesnt look particularly excited about Skechers growth potential, with analysts estimating a 5.24% CAGR for the next four years, against a 22.55% CAGR for the last four years. After four consecutive quarters of revenue beat, with a 10% spread between actual results and consensus in Q4, the market is still skeptical and I cant agree with its pessimistic view. A quick view of margin trends clearly shows there is less volatility than in the past. 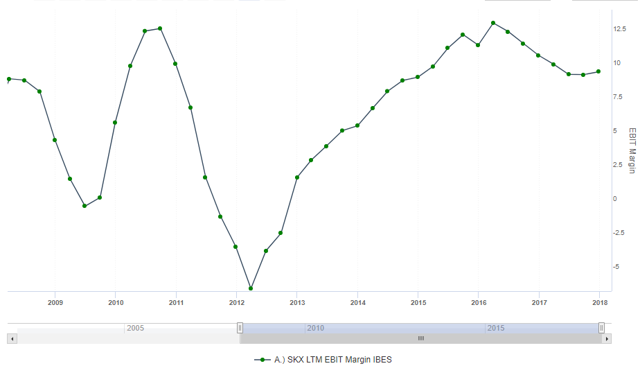 EBIT margin in the past three years has oscillated between 9% and 12.8%, a much tighter range compared to what we have seen between 2008 and 2015. Its also worth highlighting that if we exclude Nike (NYSE:NKE), Skechers has reported the highest EBIT margins in the peers group (athletic footwear) in the past three years. The interesting part of the discussion about margins is the managements optimism about margin trends. Although the significant investments for international growth have compressed margins in the past and generated a contraction from a 12.8% EBIT margin to just 9%, the management believes international growth and the expansion of the companys own footprint will allow the company to generate a solid and sustainable expansion of EBIT margin. With the expansion of its footprint in Asia, Europe, South America and some emerging markets and the infrastructure investments they made in the recent past, the management mentioned the possibility of adding accretive elements to the P&L. Besides the expansion of the own footprint and eCommerce channel, which are accretive to margins because the company can cut middle-men costs, international expansion is another source of margin expansion that is often underestimated. Outside the United States, Skechers gets a price premium. Moreover, these markets tend to absorb a higher percentage of performance products, which bring higher margin dollars. The market doesnt seem to believe in Skechers ability to grow margins either, with analysts forecasting a 10.9% EBIT margin for 2019, against a guidance of 12%-13%, with a further expansion expected in 2020. The greatest evidence that Skechers doesnt get love from the market comes from a comparison with the peers multiples, which shows Skechers is trading at a significant discount based on the multiples that the market tends to assign to similar companies. Lets have a look at how SKXs EV/EBITDA multiple compares to peers in the sportswear/athletic footwear industry. 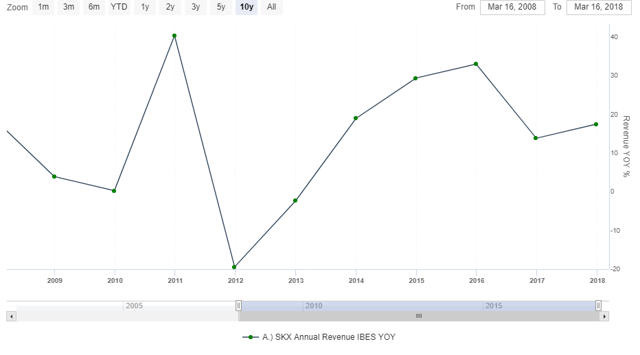 In the chart below we can see that SKXs EV/EBITDA multiple is the lowest in the peers group even though it reports the highest revenue growth. 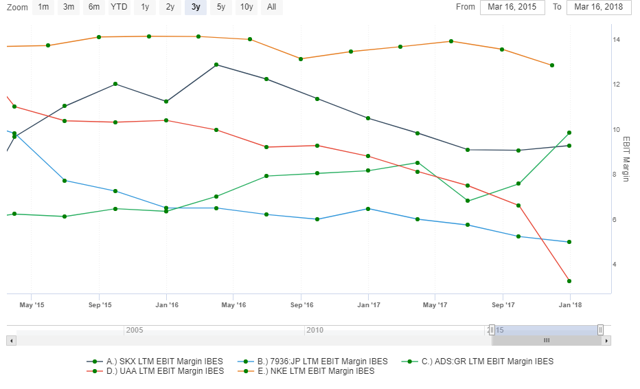 The situation doesnt change much if we run a comparison between SKX and other similarly sized companies in the footwear industry, as SKX still shows one of the lowest EV/EBITDA multiples and the highest revenue growth rate in the group. Despite a series of moderate and strong revenue beats and managements indications of a solid and durable margin expansion supported by key drivers such as the expansion into higher-margin areas and distribution channels, the market continues to maintain a conservative view about Skechers prospects. Analysts continue to be skeptical despite repeated evidence that they underestimated the companys potential, and the market continues to price the stock as a below-average growth story while the company keeps outperforming almost every peer we can pick. In this context, I think it makes sense to maintain a long on SKX at least until the market will start to price the stock like the average peer. Disclosure: I am/we are long SKX, NKE.